When I first heard we were destined to meet here for dinner, I did wonder if this was a smoking establishment. Which was a reason for concern as I am allergic to smoke and bad food. I tend to complain rather loudly and sarcastically to the amusement of my friends when either appears. Thankfully both of these issues failed to materialise on this trip. Apologies in advance for the bad photos. My camera ran out of battery so I had to resort to my dinky little camera phone among the crowd of fellow diners in the rather dingy and cramped dining scene. 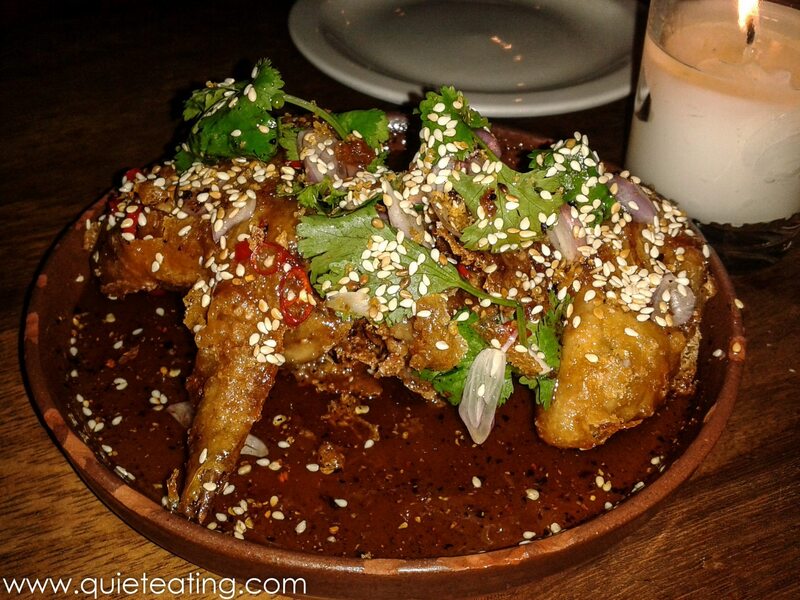 Fish sauce chicken wings. Lightly battered and then sprinkled with sesame seeds and a fish sauce dressing, these had a lovely tanginess to the deep fried goodness of the meaty wings. Smoked chicken gai yang. The chicken was served with a delightfully spicy chilli sauce. Again my tongue reveled in the symphony of sour, sweet, salty and meaty notes. Smoked aubergine. 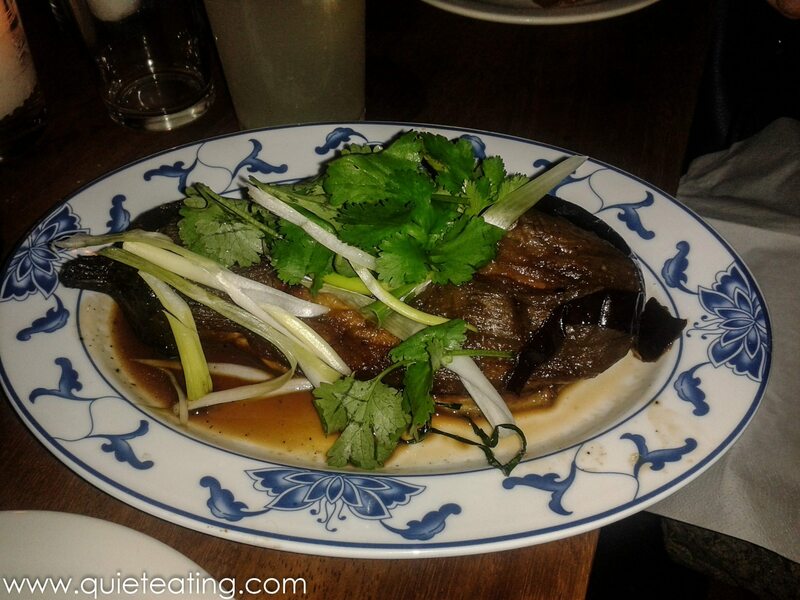 When this dish came I was excited as it brought back memories of the miso smoked egg plant I loved at other establishments. Although the egg plant was ok, it lacked the oomph I was looking for. So maybe not bad if you aren’t as picky an eater as me. Som tam tareng. 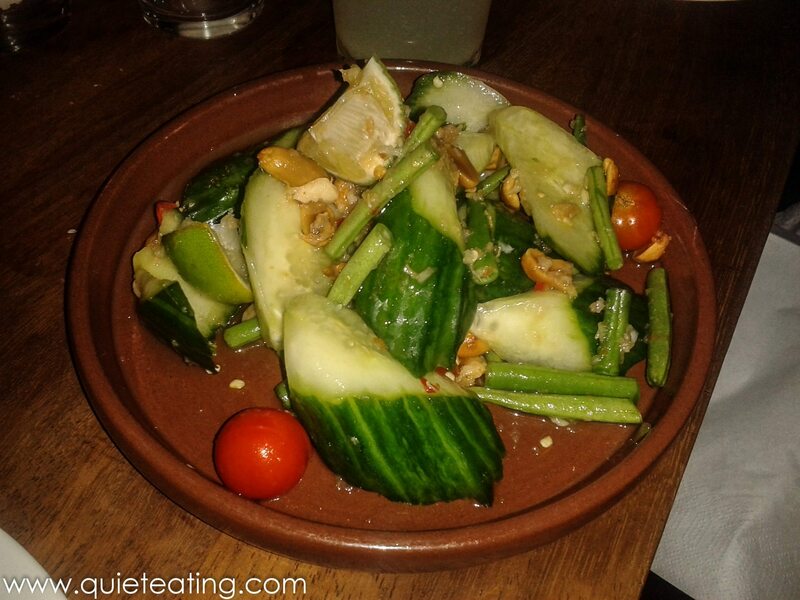 Pickled cucumber salad. It looked nice and healthy providing an interesting counterpoint to the rest of the food which I suspect tended to involve a little more oil. Pork chop. 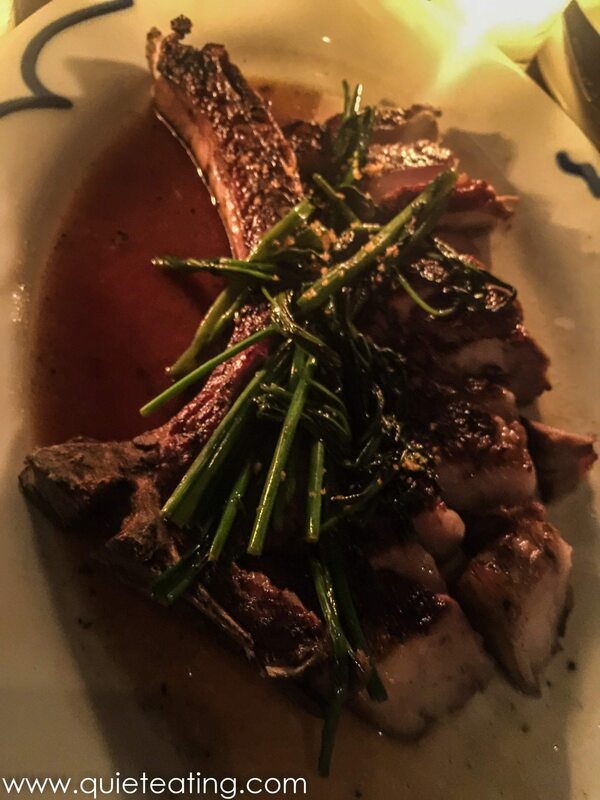 With a sweet and savory nutty sauce this pork chop was tender and moist with a smoky exterior. A feat I have tried to repeat without success as my pork chop tends to be a little raw or otherwise nuked into tasteless oblivion. Charcoal doesn’t taste that good usually. Pork belly. So soft that I think that it would deserve that oft repeated phrase “falling apart in your mouth” but because I think of myself as a more sophisticated writer, I will say that it was err.. tender. yes. tender. 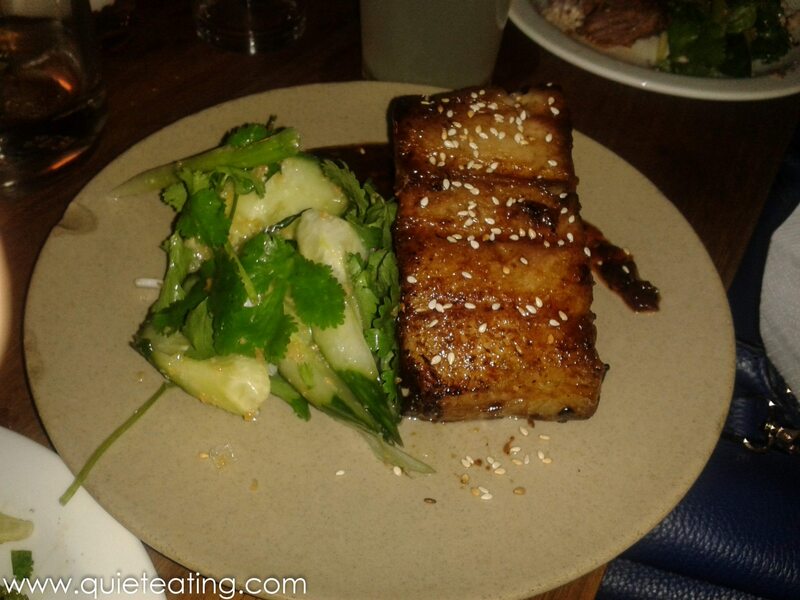 It was bursting with flavour and the added sesame seeds only helped to heighten the taste of this outstanding dish. Along with the chicken wings, this was a reason to make a repeat visit. Beef shortribs and rendang. Not very appetizing I know. I blame my fellow diners. Located as I was at the end of a table of 10, these rather mangled remains were all I had to play with. It tastes much better than it looks (to be honest it looks a little like dog food) as the weight of the sauce mixed well with the carefully cooked short ribs. I must congratulate the Goat on cooking it’s larger farm brethren. The mixture of the flavours, in true Thai fashion, combined sharp tastes to produce a beautiful cacophony. 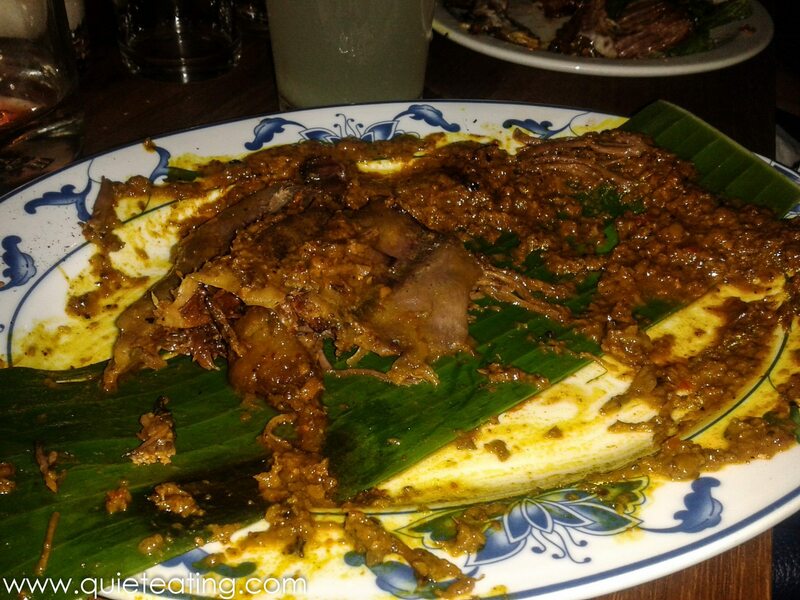 Smoked goat, the signature dish. Lovely and meaty with a strong goaty taste. If you need help imagining that taste, it is like a gamier version of lamb. 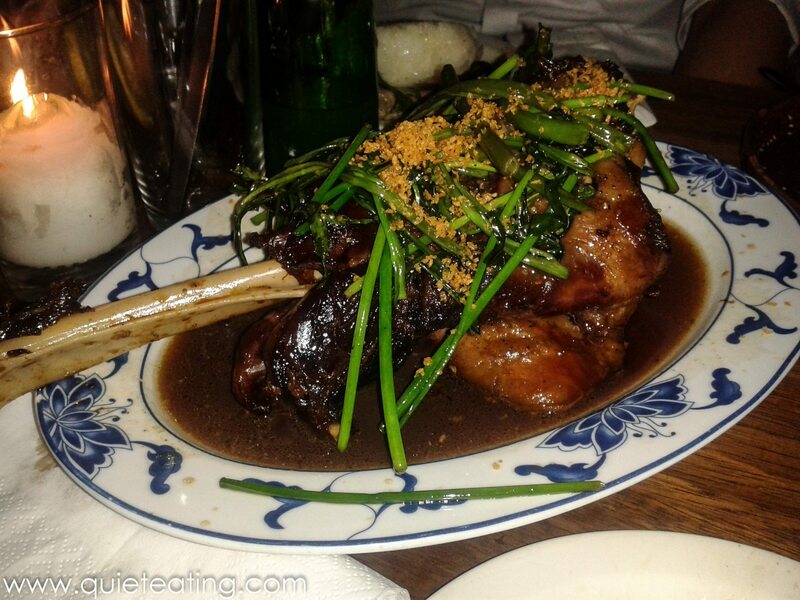 With a topping of Asian greens, this dish helped to fulfill my meat cravings through a sizable flavourful goat leg. Our journey into what I thought might be a tobacco den turned out instead to be a very pleasant surprise. 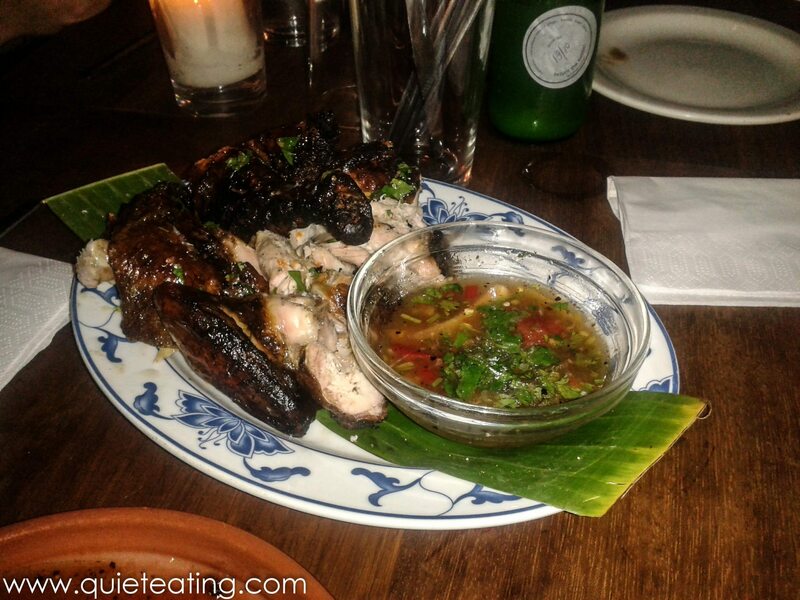 The food was fiery and some of the most authentic Thai cuisine I have had in London. The undiluted sharp flavours (I almost had my head blown off by the chilli at one stage; I am very bad at spicy food) helped to add a bit of spice to life on this dreary London day. At wallet friendly prices, this is definitely a place to try and to return to. Dinner (2 courses) was GBP 20 excluding drinks and service.